The inspiration for this drawing came from a lithograph I found in an antique medical journal. 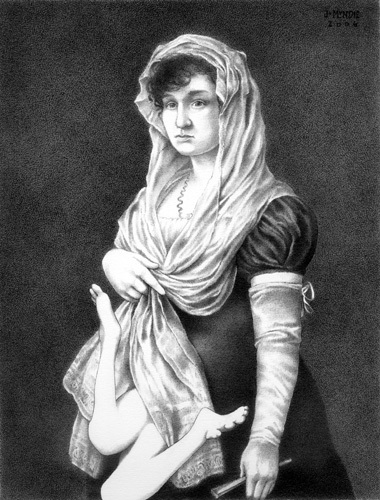 In that illustration, the patient holds a pose nearly identical to the woman in Francisco Goya's Young Lady Wearing a Mantilla and Basquiña (circa 1800). It was really quite uncanny, because even the facial features were similar; but the expressions were rather different. The woman in the medical text seemed embarrassed, whereas Goya's subject appears quietly confident. I was struck by the contrast between the palpable vulnerability of the medical illustration and the glamour of Goya's painting, which is practically a fashion plate. Goya's subject was obviously pleased to have her portrait painted in her finest clothes and confronts the viewer directly; but my subject was more modest, so I have chosen to avert her gaze.